In January 2012, I wrote this post about a video of Andy, Howard, Joe, and Bob in a beautiful extended performance, and ended with a wish that some CD producer might record this group. Delmark Records heard my plea, or perhaps they already knew it was a good idea. Et voila! Then Andy asked if I would be interested in writing the liner notes, which pleased me no end. Here’s the verbal result: the music is within your grasp. 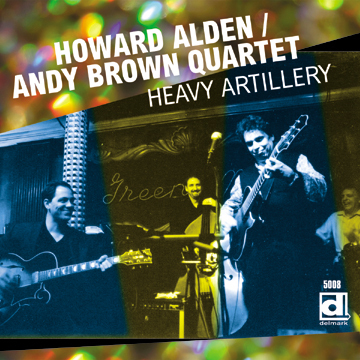 Howard Alden and Andy Brown are remarkable improvising artists – who became two of the finest jazz guitarists today. But their particular artistic intelligence – an impassioned classicism – would have made them stand out no matter how they expressed themselves, in skateboarding or water colors. In their hands, the emotions contained in the notes – joy, sorrow, musing, ebullience – come to us enriched and intensified. But they understand that music is more than simply a riotous series of notes flung at the listener. Each phrase, each chorus has its own lovely compositional shape, a breathing existence, and each performance is a satisfying three-dimensional dance. Although Howard and Andy are separated by nearly two decades, this session isn’t a showy contest between Alpha Dog and Ambitious Puppy. Rather, it is a friendly conversation scored for four – a living swing community at play. This session grew out of mutual admiration and respect. Andy says, “When I moved to Chicago I really missed playing with and hearing Howard. I made an effort to bring him to town, so everyone could hear him, and so I could play with him! Dave Jemillo, the owner of the Green Mill, set up a weekend for us in 2010, and the group on this recording was formed. I knew Joe Policastro and Bob Rummage would be ideal. I’ve played with both of them so much, and Howard felt the same way. We’ve been lucky to bring the group back to the Mill several times, and on Howard’s last trip to Chicago we booked a short tour as well as a day in the studio, the results of which can be heard here. We picked some standards (Louisiana, If Dreams Come True, I Had The Craziest Dream), as well as some Brazilian tunes we both enjoy (Vocé E Eu, Brigas Nunca Mais). It’s always fun for two guitarists to play unison and counterpoint lines together, and we worked up Thad Jones’ Three And One, as well as a 1928 Louis Armstrong tune Howard used to play with Ruby Braff, No One Else But You. We also paid tribute to some of our favorite guitarists with Django Reinhardt’s Heavy Artillery, and two tunes recorded by Tal Farlow, the Clark Terry blues Chuckles and a tune Tal co-wrote with Red Norvo with the caffeine-inspired title I Brung You Finjans For Your Zarf. Bob and Joe lay out on I Had The Craziest Dream and If Dreams Come True. The results are both translucent – swing that is easy to listen to – and complex – ask a professional guitarist to anatomize what Andy and Howard are doing in any four beats, and stand back. But ultimately music like this doesn’t need annotation. Howard takes the first solo on Louisiana and Chuckles. After that, you’re on your own – to analyze and enjoy this joyous beauty through many hearings to come. And don’t forget the selfless, energized yet subtle playing of Bob and Joe – who add so much without insisting on taking over. My only worry is that the title HEAVY ARTILLERY might warn of an acoustic assault. But this disc is much more like Cupid’s quiver – a series of loving arrows aimed at our hearts. I mean it, and so do they. Howard, Andy, Joe, and Bob make deep yet light-hearted music. Hear more on this CD.